Have you thought to build an On-boarding Campaign? When new customers or staff come on board, it’s easy to assume they’ll make their own way. It’s likely your organisation has a series of resources that would be valuable to these new folks, however finding these resources can be a challenge. Have you thought about creating a campaign to introduce them to what you do over a period of time? It’s almost like a lead nurturing campaign, but perhaps is better called a “new customer nurturing campaign”. New Customers: where to start? I’ve found in the past that the best place to start is with some of my trusted customers, those who have been with me for some time. Asking the right questions about their experience when they first came on board as a customer helps build an on-boarding campaign that’s relevant and helpful. Once you have their feedback you can start to pool the various resources that will help new customers. You then need to look at “chunking” the information into easily digestible components. A single email with 30+ links to a range of resources is overwhelming. 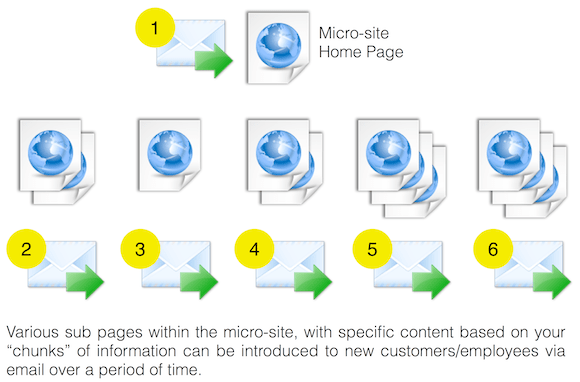 I’ve found that building a micro-site with a range of links is a great idea. You can have the 30+ links on the landing page/s and then create a series of emails, perhaps ten delivered once a week for ten weeks. Each email could focus on one of the “chunks” of information you created and provide specific links to the resources via the micro-site. New Employees: where to start? The principles outlined above for new customers are essentially the same for new employees. Depending on the size of your business, Human Resources, departmental managers or team leaders will probably have an on-boarding program in place. You can help them save time by automating their existing on-boarding program. It can also serve as a tool for face to face discussion as managers work with new employees during their trial period. Meet our Key Clients Who are our Competitors? Talk with a few trusted customers or recent new hires to understand what they found helpful when they first came on board and also where they were left wanting. Build your digital assets and where possible link to existing content, there’s no need to reinvent the wheel. What you’re trying to do is help new customers/employees get up to speed faster with access to your existing assets. Think about frequency. For new customers be sure the sales person responsible for the account is aware of each communication that goes to their customer. Make time, perhaps once a quarter, to review the content and ensure it’s up to date, the links still work and the information is still relevant. Measure the performance of the campaigns. Understand which pages are getting the most hits, which links are getting the best click-through. Don’t think of the on-boarding program as a static resource.